I know this pattern originally came from one of the Quilting magazines. As I never do anything the way I am told, I changed the block size and created my own quilting patterns to accomodate my growing machine quilting skills. This one his half hand quilted and half machine quilted. I made it for my son, for the girl he would one day marry. Thanks be to God, he chose a wonderful woman, and I was delighted to send him the quilt to give to her. Then, I forgot it until I went to photograph the Seminole quilt, and found this quilt next to that! I wonder how many other quilts are out there that I can’t even remember? When I teach this quilt, I show the class, and then fold it and ask what color it is. When they say “red and white” we look at the quilt again, to see the huge variety of colors that qualify as “red” in this quilt, all the way from deep purples to orang-y oranges, and the entire range of prints and solids in between. 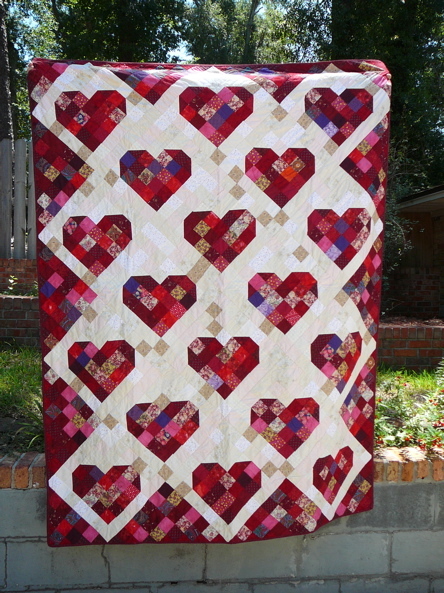 Scrap quilts are fun that way – they can fool the eye. And there is a real art to making sure the colors blend, and that no one color draws the eye and attracts too much attention to itself. This entry was posted in 2001, Color Theory, Germany, Gift, Hand quilted, Machine pieced, Machine quilting, Teaching Quilt. I don’t have any paperwork. Kathy. I remember it is done on a grid 7 squares by 7, heart resting on one side, and then set on point, using additional squares to do the setting triangles by putting them together and trimming them down – again, they would be seven to a side, to fit the side of the square. Thanks for posting this. I copied it (with slight variation ) and it’s looking quite good (although the boarders are a bit fluttery !